When I came across the Office for National Statistics latest life expectancy. I had a couple of thoughts after entering my age. The first was "25% chance of reaching 95, never" and secondly that "averages are always misleading”. Knowing how long you require an income for is one of the great variables of financial planning. Of course, the simple truth is that we have absolutely no idea when our time is up, meaning trying to plan for our retirement can be a complicated business. When I came across the Office for National Statistics latest life expectancy calculator http://visual.ons.gov.uk/what-are-your-chances-of-living-to-100/ I had a couple of thoughts after entering my age. The first was “25% chance of reaching 95, never” and secondly that “averages are always misleading”. One client once summed it up with the comment “life would be easy if we all had sell-by dates”. Ummm, I’m not sure about that but it certainly would make me focus on my bucket list and what is important in life. Guessing our “sell by date’ is aided by the ONS calculator because otherwise life may be enjoyed a little too much or worse still, not enough! The truth is that both these methods of calculation are often flawed. Medical advances are improving every year and so there is a strong chance that you will now survive whatever illness led to the death of your parents. The averages are also skewed by location and lifestyle factors. As a IFA based in London and Surrey my clients may well live longer than the average due to what is often referred to as the ‘postcode lottery’. A 2015 modelling study looking at trends in life expectancy in the UK estimated that male babies born in 2030 could live to an average of 85.7 years, with females living an average of 87.6 years. Compare this to the average life expectancy of someone born in 1930 – 58.7 years for men and 62.9 years for women – and you can see that there is a strong chance you’ll live a lot longer than your parents. Similarly, estimating that you will live to the average age is also flawed. Life expectancy numbers that you hear or read in the news are, as mentioned above, life expectancy at birth. But someone doing a retirement planning calculation has already survived the problems of infant mortality, childhood diseases, teenage driving accidents, and other random causes of death. 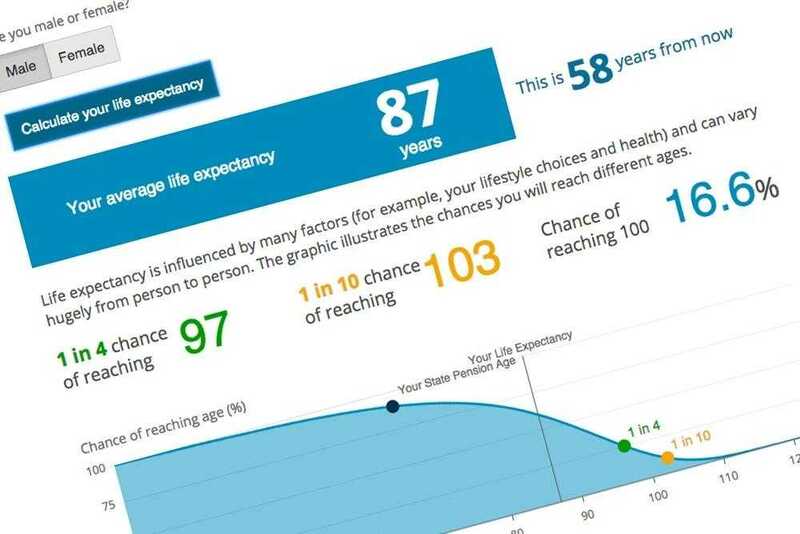 So if life expectancy at birth is in the high 70s, by the time you’re 60 or 65 your life expectancy is well into the 80s, depending on gender, general health and personal habits. The main value of these calculators is to clarify a simple fact: you might live a lot longer than you think you will. There is the key point here: the chances are that you will live longer than you anticipate and you should therefore plan your retirement accordingly. That means making sure your pension drawdown lasts longer than you estimate or at least having a plan B if you live longer than you expect.